Do Tax Hikes Cause Inflation or Deflation? It doesn't matter if the government raises taxes on everyone equally, because it takes money away from everyone in equal proportions, so no one is made worse off. The tax just results in an increased value of the money you keep. Right? The short answer is no. The long answer, I suppose, is that it depends on what the government does with that money. I was asked this question recently, and set out to show why the answer is no with an abstract theoretical model. But then I realized that it is just easier to see why its wrong using intuition. Ok, lets simplify the economy a bit. 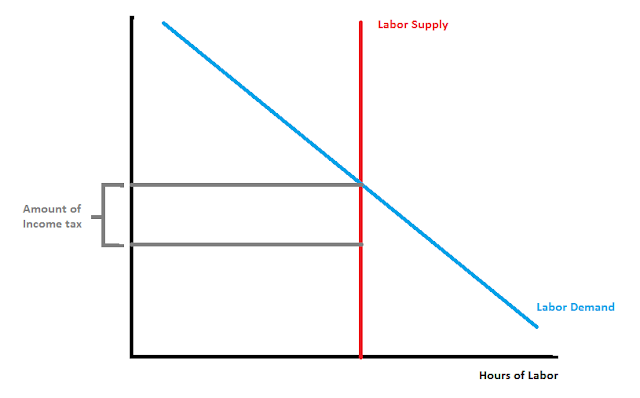 Suppose that people supply a fixed amount of labor regardless of the wage rate (that is, elasticity of labor supply is zero). This is not quite realistic--in reality people increase the amount of labor slightly in response to large increases in wages (that is, the elasticity is small but positive)--but doesn't alter our conclusion, so lets roll with it. Also, assume that there is no involuntary unemployment, meaning that the economy is operating at full capacity (hence, this isn't necessarily true in the current reality with 7.7% unemployment). Finally, lets just abstract away from the reality of many markets with differentiated goods and services by aggregating them to a single representative good. The nuances of differentiated products does not alter our conclusion either. Now, in this case we are increasing G. I think anyone can plainly see that we cannot increase G without either increasing Y or decreasing C. But, Y can only increase if workers work more hours, so if the elasticity of labor is zero, then each unit increase in G must cause a corresponding decrease in C by one unit. The inuitive way to interpret this is that taxes do make people poorer, even if they are spread evenly across all people. Every unit of output that the government buys is a unit of output that the public can no longer afford to buy, due to the taxes. This graph shows the effect of a generic tax on a good or service. If we increase a tax on an item, its price will go up, and the quantity will fall (in the graph, the tax reduces output from Q2 to Q1). I've labeled four regions of the graph: A is the amount of the tax that consumers pay in the form of higher prices. Region B is the amount of the tax that the firm pays in the form of reduced profits (for the uninitiated, the reason the firm pays part of sales taxes on consumers is that they will offset some of the decreased demand for their goods by reducing the pre-tax price, the "price paid to suppliers"). Regions C and D are called dead-weight losses. If there were no tax, that wealth would be split by households and firms, but due to distortion of incentives, with the tax no one gets that money--they are resources that disappear from the economy. This graph applies equally to sales and income taxes--for the latter, simply replace "quantity" on the x-axis with "Hours" and replace everywhere it says "price" with "wage." So an income tax causes firms to increase the wages they pay to increase, even though households keep less in take-home pay than with no taxes. 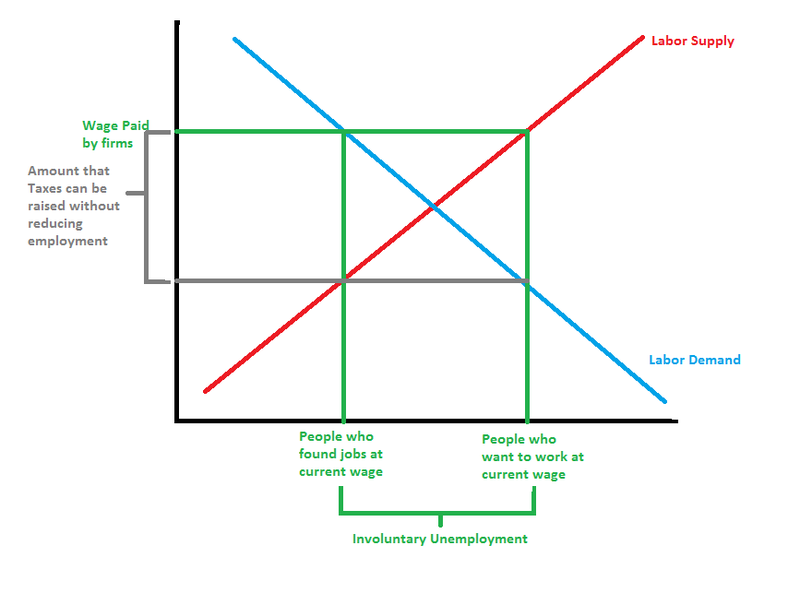 In this case, the labor supply doesn't change depending on the tax, and the wage that firms pay does not rise (why would they, if they have just as many workers either way?). That means that all of this income tax is paid for by workers, not firms. Note that in this economy, the total amount of GDP is not affected by the tax--all households are poorer because they keep a smaller share of their income, but there is no impact on aggregate GDP, and no price inflation. There is an easier, more intuitive way to see why tax hikes actually cause inflation (if anything) and not deflation. That is, we can simply appeal to monetarism. The quantity of money in circulation does not depend on the amount of revenue the government raises in taxes, because they are replacing every dollar they tax with a dollar of purchases. Roughly speaking, the prices in the economy are determined by the ratio of dollars "printed" by the Federal Reserve to output (GDP). The numerator doesn't change regardless of taxes. The denominator may change, depending on the situation. With an elasticity of labor equal to zero, GDP is unchanged, so prices are unchanged. With a positive elasticity, GDP falls because people don't want to work as much for a lower disposable income, so prices go up. From this description it should be clear why there was a caveat to my original answer: it depends on what the government does with the money. If they were to literally tax income and simply burn the revenues without buying anything, then we would see a decrease in the money supply (numerator falls). 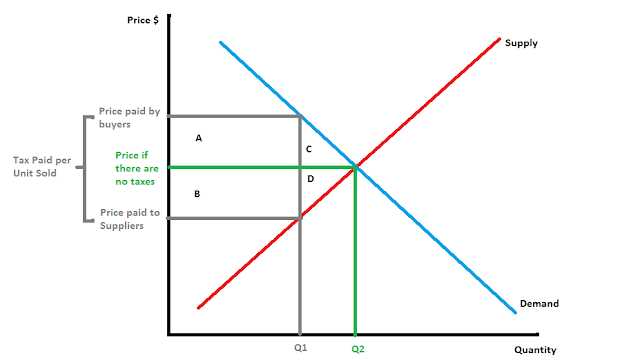 GDP would also fall due to the distortion effect of the tax, so the impact on prices is ambiguous in this case. But, this line of thought is not worth pursuing because this is not what the government does with revenues. As with everything in economics the reality is somewhat more complicated. In particular, we do have involuntary unemployment much of the time, which means that income taxes need not reduce GDP. This is a graph of the labor market in which there is involuntary unemployment. Analytically, we can represent this by saying that the wage firms are paying is "too high" meaning that at that wage, more poeple are willing to work than firms are willing to hire. It's important not to take the phrase "too high" literally though, because it is not at all clear what mechanism causes this to happen (meaning that it is not, in general, possible to reduce unemployment by trying to decrease wages). The point is in this case, we could potentially increase income taxes without reducing employment or increasing wages. We can then use that revenue to hire some of those unemployed workers. In this case, GDP would rise, but prices would not change. Hence, taxes make us better off, not worse off. A variant of this line of thinking is what makes up the mainstream, Keynesian, theory of macroeconomic recessions.